Silvio Berlusconi arrives for an European People's Party meeting prior to an EU summit in Brussels on Oct. 19, 2017. Opponents of Silvio Berlusconi accused the former prime minister on Monday of being to blame for a surge in migrants to Italy in recent years as campaigning for a national election turned increasingly ugly. The build up to the March 4 vote was shaken at the weekend when a neo-Nazi shot and injured six African migrants in central Italy, in a racially motivated attack after a Nigerian man was arrested on suspicion of murdering a local teenager. The 81-year-old billionaire accused them of living off “their wits and crime” and said he would initiate mass deportations if he and his rightist allies win power next month. The ruling center-left Democratic Party (PD) has been lambasted by opponents for not doing more over the past four years to stem the flow of some 625,000 migrants into Italy — most of whom set sail from Libya, which was plunged into chaos after NATO ousted former strongman Moammar Gadhafi in 2011. “If migrants come to Italy it’s because someone went to war with Libya, and the prime minister was Berlusconi,” said the PD leader Matteo Renzi, adding that migrants got stuck in Italy because of an EU refugee pact that Berlusconi signed in 2003. The leader of the anti-establishment 5-Star Movement also said Berlusconi was heavily responsible for the migrant crisis. 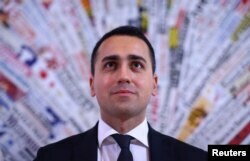 Luigi Di Maio of the 5-Star Movement looks on as he attends a news conference in Rome, Italy, March 23, 2017. Opinion polls say Berlusconi and his far-right partners — the League and the Brothers of Italy — will win the most votes at the March election, but will probably fall short of an absolute majority. Saturday’s gunman, Luca Traini, stood for the League in a local election last year, but did not receive any votes. Police found a copy of Adolf Hitler’s Mein Kampf at his house and he has a neo-Nazi symbol tattooed above his eyebrow. Leftist politicians accuse League leader Matteo Salvini of whipping up hostility to migrants with his often fierce rhetoric against the newcomers — a charge he denies. Berlusconi has sought to allay fears over the sometimes extremist tones of his allies by promising to be a moderating force should they govern together. However, his comments on Sunday showed he had bought into their tough line on migration. He doubled down on his message on Monday, urging Italians to signal to the police the whereabouts of illegal migrants and promising mass repatriations by boat and plane. “In order to find them, everyone can point out their presence and these people will be picked up,” he told Rai state television.